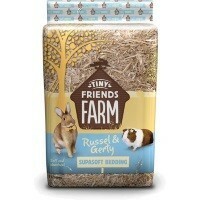 Supreme Tiny Friends Farm SupaSoft Bedding is the ideal bedding material for the comfort and safety of all small animals. It may help to keep your pets living environment fresh, clean and sweet smelling. Made from the highest quality straw which has been chopped for extra comfort helping it fluff up and provide a warm natural bedding.